After 10 days in Italy we returned home to Scotland to blue skies, balmy breezes and a garden which had exploded with flowers and berries and green, green, green. Temperatures have been consistently above 20 oC and we’ve had a BBQ every other night. Marco and I walk in a field of wild flowers first thing in the morning then in the cool woods in the early evening. After many years of wet, windy and grey summers, we are finally getting a summery summer. Well done, July. Well done! 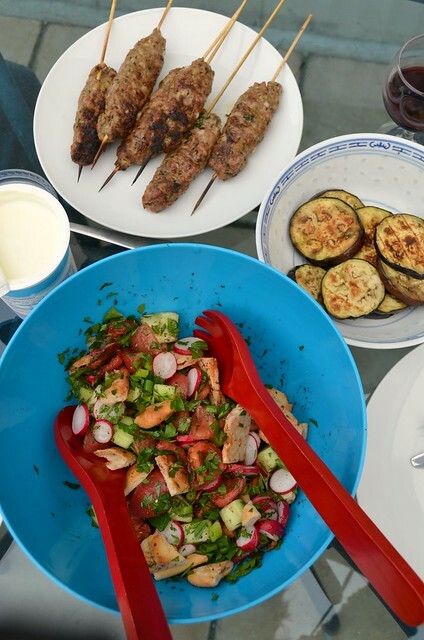 The best BBQ meal we’ve had so far was lamb koftas, grilled aubergine and a colourful, tart Lebanese salad, fattoush. 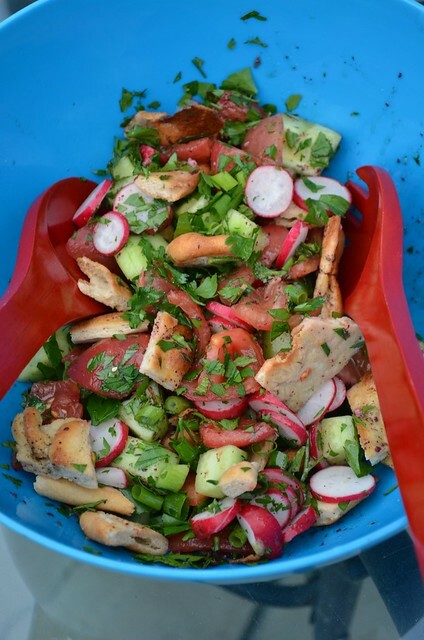 The fattoush recipe is below. Not 100% happy with the kofta recipe so I’ll wait until I’ve tried that again before I post it. It won’t be long though. Looking forward to having this meal again soon! Cut the cucumber into 2 cm chunks and place in a colander. Sprinkle salt over the cucumber and leave. After 30 mins, shake the cucumber to remove moisture and pat dry (no need to be thorough) with a clean teatowel. Meanwhile, peel and deseed the tomatoes then chop roughly. Toast the pitta under a hot grill until crisp and leave to cool. Slice the radishes finely and chop the spring onion. Mix the dressing together by putting the ingredients in a clean jar then shake vigorously. Break the toasted pitta into bite sized chunks and toss with all the vegetables. Drizzle with the dressing (you may not need all of it) and toss gently. Serve immediately so the pitta retains some of its crispness.